Since the International Rugby Board (IRB) decided to take a risk and include the United States as a stop on the IRB Sevens World Series (this years title sponsor is HSBC Sevens World Series) tour, the sport of rugby has incrementally grown in popularity in a country where its predecessor, soccer is still trying to take root. The risk (and an injection of millions of dollars over the course of several years) is finally paying dividends. Though the sport has been played on American soil for many years thanks to expatriates from England, South Africa, Australia, New Zealand and from around the Pacific, there is still plenty of work to do before the sport enjoys the same success as it always has in those countries. Perhaps USA Rugby’s biggest dividends has been realized through the USA Sevens which began back in 2004. The inaugural event, held at the Home Depot Center in Carson, CA. enjoyed nominal success. But though attendance seemed marginal at the time, it was evident then, that a rabid rugby fan base was ready to embrace the event. Since then (and relocation from the Home Depot Center to Petco Park in San Diego and now Sam Boyd Stadium in Las Vegas), the popularity of the event has increased dramatically. The USA Sevens has become a staple for rugby fans here in the United States and each year the event gets bigger and better. I’ve attended every year except one (2005) and I’ve been witness to its growth and popularity. 1) The venues – The Home Depot Center is a world-class facility and the grounds are exceptional and immaculate. Fans loved Petco Park! San Diego hosted the event from 2007-09 and anyone who has watched San Diego Padres baseball games at the park know why. There is a feeling of being up-close-and-personal with the players that you can hardly find anywhere else. Add to that the seaside charm and numerous activities and amenities surrounding the venue made the previous three years of the event a dream destination. 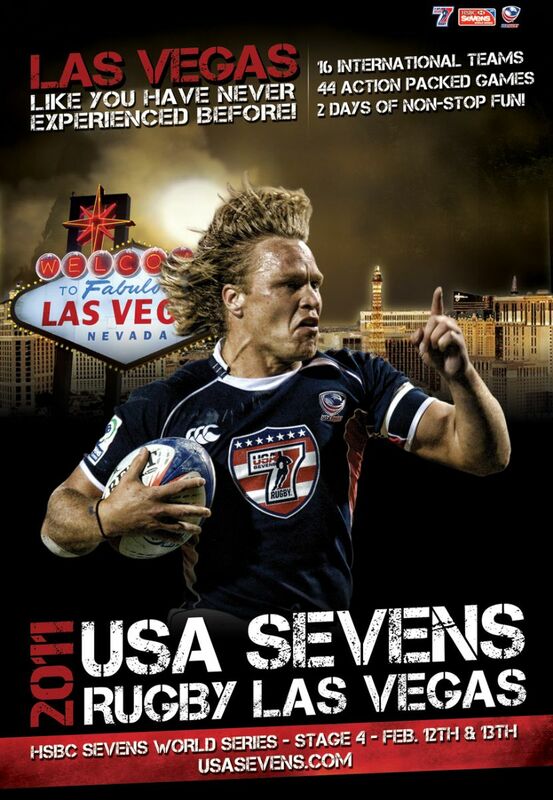 We may not have envisioned Sam Boyd Stadium to be a great USA Sevens venue but let’s face it, it’s Vegas, ‘nuff said. 2) The players – have you ever seen LeBron James walk out into the stands just to say hello and swap dessert recipes with the fans? Of course, its probably ill-advised for any NBA franchise player to step out of his comfort zone and into the arms of adoring fans but at the USA Sevens its not uncommon for players from these proud rugby nations to stroll up and down the aisles to say hello and pose for photos with fans. These players are some of the most recognizable names and faces in the rugby world, but they are almost always approachable, humble rugby blokes first, international rugby stars second. 3) The fans – if you have never been to an international competition, whether it’s an Olympic event, soccer World Cup, an international rugby test or even a Davis Cup you can’t quite capture the electricity and the thrill of being among fanatic supporters of their national or favorite team. Okay, there’s fanatic’s at every Oakland Raiders or L.A. Lakers game but there is something different about Kenyan’s, Aussies, Fijians and Samoans singing, clapping and dancing at the top of their lungs even when their teams haven’t played a single match. There is sportsmanship and camaraderie in the stands, just as there is on the field. We cheer for the underdog and extol the supremacy of the powerhouses. We shake the hands of the victor and applaud the efforts of the fallen. Every February on a pitch surrounded by the radiant colors of the national teams that take part in the event, it is the fans, who are the true success and the spectacle of the USA Sevens. For more information about the upcoming USA Sevens and to purchase your tickets, visit the official USA Sevens website.